Offer all the popular soft serve variations from low or non-fat ice creams to custards, yogurt and sorbet. Serve two separate soft serve flavors, or an equal combinaion of both in a twist. Mix hopper, two, 20 quart (18.9 liter). Separate hopper refrigeration (SHR) maintains mix below 41 degree F.(5 degree C) during Auto and Stanby modes. Inicator lights, digital readout displays hours since last brush cleaning to assure product safety. Mix low light alerts operator to add mix. Audible alarm may be enabled to sound when mix is low. When the mix out light flashes, the unit shuts down automatically to prevent damage. Touch screen controls, microprocessor touch controls are embedded in durable tempered glass panel. 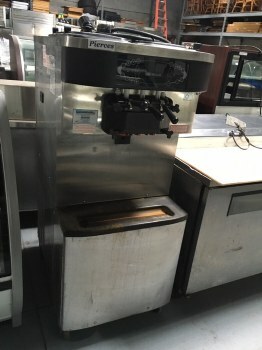 viscosity is continually measured to dispense consistent quality soft serve desserts. 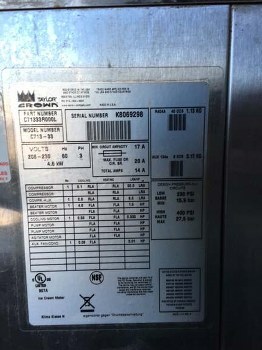 temperatures in the hoppers or freezing cylinders may be displayed at any point of operation. draw counter allows operator to view number of servings despensed.